Looks delicious, no? You see, there is one course in there, the halibut, that simply didn't work for me. I do my best to appreciate seafood these days, trying not to place any food biases in the children, not to mention the health benefits. However, back then I just didn't care for seafood. Which brings me to Skinner. 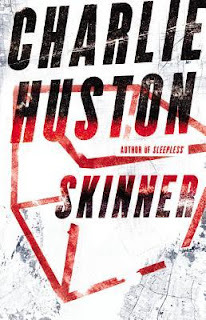 Skinner would make a fantastic movie. The characters are engaging and quirky. The plot is a modern technological thriller - spy vs. spy vs. spy and the effects of facebook and twitter and news 24/7. 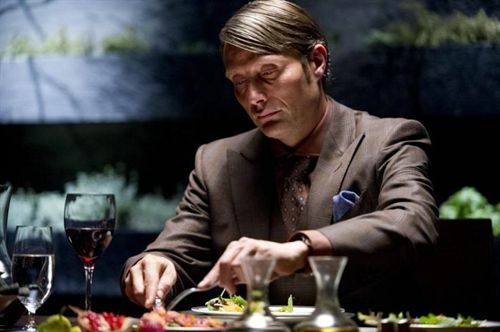 This is a delicious seven-course meal, however, there was a fish dish in here, and for me that was the style of writing. Huston writes as if a train of thought. A character is thinking of what to say or emphasizing their point then maybe. They. Talk. Like. This. "I didn't understand it. I still don't. I wasn't human. Raised in a box. Copying behavior. Inhuman. Inhumane. Very little differentiation. Killing people. Well. I was a monster." "No, this has not happened before. "What has happened before are any number of things that feel similar. "9/11. The Invasion of Iraq and Afghanistan. London subway bombings. Bombay attack. Madrid bombings. Asian tsunami. European heat wave. Darfur. Somali pirates..."
That list continues for a full page. And so how do you rate a book as such? A book that has everything you want, but is just told in a manner that you find unappealing? On Goodreads I went with three stars - "liked it" in Goodreads speak. However this has potential for a better movie - fantasy casting: Liev Schreiber as Skinner and Claire Danes channeling her craziest Carrie Mathison as Jae. Make it happen! Skinner was The Wolverine; a good story suffering from the manner in which it is told. Haha, I love your little analogy for this one! Thanks. I find it easier to describe how I feel about something when I can relate it to something more concrete - like an aversion to fish.